Q: We noted that yesterday, State Councilor and Foreign Minister Wang Yi met with French Foreign Minister Le Drian in Paris. The two sides talked about China-France economic and trade investment and cooperation. Could you provide more details? A: On January 24 local time, State Councilor and Foreign Minister Wang Yi, who is in Paris for the 18th session of the Consultation of the Coordinators for the China-France Strategic Dialogue, met with French Foreign Minister Le Drian. 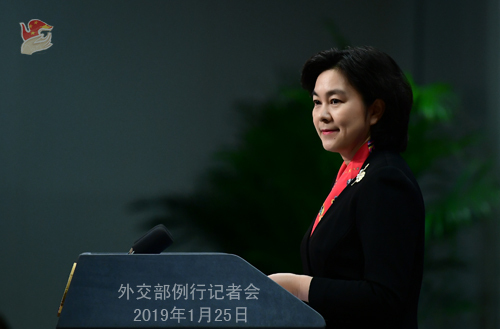 The two foreign ministers attended the launching ceremony for the celebratory activities commemorating the 55th anniversary of China-France diplomatic relations. The two sides held in-depth exchanges on bilateral relations including economic and trade investment and cooperation and issues of mutual interest. We have issued the relevant readout. State Councilor Wang Yi said that the world is facing unprecedented changes in a century with the existing international systems and rules and established consensus on multilateralism and trade liberalization sustaining multiple challenges and impacts. China and France are committed to upholding the international systems with the purposes of the UN Charter at the center, preserving the rules-based multilateral free trading system, advocating openness and cooperation, and building an open world economy. China will unswervingly deepen reform and expand opening-up, and hopes that France will offer a fair, equitable and transparent business environment for Chinese enterprises. French Foreign Minister Le Drian said that as multilateralism is facing severe challenges, France and China, as permanent members of the UN Security Council, should remain devoted to upholding and strengthening the multilateral systems. France is always open to investment from Chinese enterprises, will not discriminate against specific companies, welcomes the operation of Chinese enterprises, and stands ready to extend more support to them. Q: First, the US military confirmed that two US military vessels sailed through the Taiwan Strait on Thursday. The US side claimed that it was a normal passage that conforms with the international law. But we have noted that the US has been sending its military vessels through the Taiwan Strait at a higher frequency. What is your response to the US actions and remarks? Second, on Thursday, speaking at the World Economic Forum (WEF) in Davos, financial tycoon Soros made a tough speech against China. He said that China is the most dangerous opponent to the open society and proposed to crack down on Chinese hi-tech companies. How would you like to respond to his remarks? A: On your first question, China paid close attention to and monitored from start to end the passage of the US military vessels through the Taiwan Strait. We have expressed our concerns to the US side. The Taiwan question is the most important and sensitive one for China-US relations. 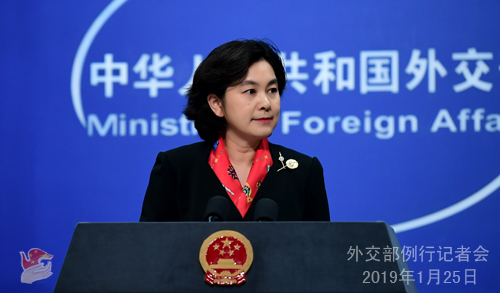 We urge the US to strictly abide by the one-China principle and the stipulations of the three China-US joint communiques, and prudently and properly handle Taiwan-related issues to avoid damaging China-US relations and cross-straits peace and stability. 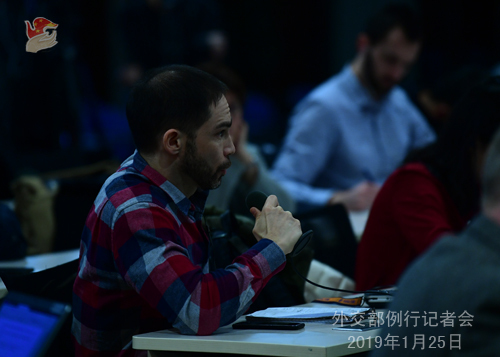 You said that the US military vessels have made more frequent passages through the Taiwan Strait, while the US side claimed that these passages are normal and compliant with the international law. I want to make a comparison here and would like to invite you to envision a scenario with me. Suppose that a family has two courtyards, a smaller one lying in front of a large one, divided by a passage which could be used by passersby to come through for convenience's sake. However, if there is someone who frequents this passage just to issue provocative words or make provocative moves, or even attempt to threaten or endanger the safety of the family and make them discomfort, then how would you feel? We hope that the US side will exercise caution on this issue. On your second question, I have seen relevant reports. In today's world, it is very easy to tell who is opening the door and paving roads and who is closing the door and building walls. Therefore, it is meaningless and worthless to refute these words made by certain individual that call white black and confuse right and wrong. Living in this era where globalization is advancing further on all fronts, only by seeing things in a dynamic way and taking in things with an open and inclusive mind can a country find greater development space for itself and its relations with other countries. We hope that the relevant people on the US side can set right their attitude, broaden their horizon, and view China's development in an objective, reasonable and correct way. Q: We have learned that Vladimir Norov has already assumed the post of Secretary General of the Shanghai Cooperation Organization (SCO). What is your comment? A: Mr. Norov is Uzbekistan's veteran diplomat. He was unanimously elected by the leaders of the SCO members at last year's SCO Qingdao Summit in June, which fully demonstrated the trust and expectations the SCO has placed on him. The SCO is faced with new opportunities for development at the moment. We believe that during his tenure, Mr. Norov will live up to the great trust of the leaders of the SCO members and contribute to promoting the development of the SCO. As the host country of the SCO Secretariat, we welcome Mr. Norov's arrival to start his work here and will continue to offer our strong support and assistance to the SCO Secretary General and Secretariat. Q: Do you have more information about the case of Yang Jun? Where is he being held? Has he been given any access to consular support by the Australian Embassy? What is the current situation of Yang Jun? A: Like I said yesterday, Yang Jun has been taken compulsory measures and is being investigated by Beijing State Security Bureau in accordance with the law for engaging in criminal activities that endanger China's national security. China and Australia have unimpeded channel for consular communication. China has provided necessary assistance for the Australian side to perform its consular duties, including consular access. All the legal rights of Yang Jun have been fully guaranteed. Q: According to media reports, the US proposed to hold talks with Russia on arms control on the sidelines of the meeting of five nuclear-weapon states in Beijing next week. Do you have any information on preparation for such a meeting? Is China willing to provide such a platform for the two countries to hold negotiations? A: With regard to the meeting of the five nuclear-weapon states in Beijing, yesterday I have talked about relevant information. China will host a meeting of the five nuclear-weapon states on January 30 in Beijing. The five nuclear-weapon states will take this meeting as an opportunity to have an in-depth exchange of views on such issues as nuclear policies and strategies and pool their efforts to address the challenges facing international security and uphold global strategic stability and multilateral arms control system. We certainly welcome the US and Russia to strengthen bilateral communication and properly address each other's security concerns. 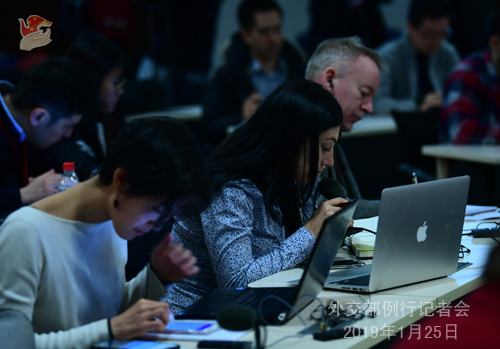 Q: Canada's Ambassador to China John McCallum has reportedly said that he misspoke with some comments with regard to the extradition process of Meng Wanzhou. He said that there is no political involvement in this process. What is your comment? A: Whatever the Canadian side said, China's position on this issue has always been very clear-cut. As to this issue, the Canadian side has made a serious mistake from the very beginning. It is by no means an ordinary judicial case. Instead, it is a serious political incident. Like I said yesterday, we hope that Canada can recognize the seriousness of this issue instead of risking endangering itself for other's gains. Q: Can you confirm reports that a Chinese delegation headed by Vice Finance Minister and Vice Commerce Minister will be in the US on January 28 to prepare for the China-US trade talks? 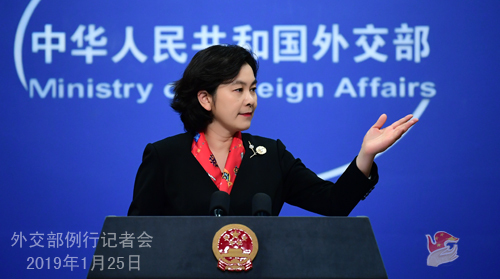 A: Regarding the China-US trade talks, actually the Spokesperson for the Commerce Ministry has responded to journalists' questions. According to my information, China and the US maintain close communication on the relevant arrangements for Vice Premier Liu He traveling to the US for high-level trade talks. I would refer you to the Commerce Ministry for specifics. Q: Reports say that the United States is seeking to ensure that Venezuelan oil revenues go to the country's self-declared interim president and not to Nicholas Maduro's regime. What is your comment? A: Yesterday I elaborated on China's view and position on the current situation in Venezuela. China maintains that all countries should abide by the purposes and principles of the UN Charter, especially the norms governing international relations and the principles of international law such as non-interference in each other's internal affairs, mutual respect for sovereignty and territorial integrity and no threat of force. The Venezuela's affairs must be and can only be chosen and decided by the Venezuelan people. We call upon all relevant parties to respect the choice of the Venezuelan people and support them in seeking a political solution through peaceful dialogue within the framework of the Venezuelan Constitution. Venezuela maintaining stability and development serves the interests of all relevant parties. We hope that all relevant parties can contribute more to Venezuela's stability. China is opposed to foreign interference in Venezuela's affairs, in particular the threat of military interference. We will continue to support the efforts made by the Venezuelan government to uphold national sovereignty, independence and stability. 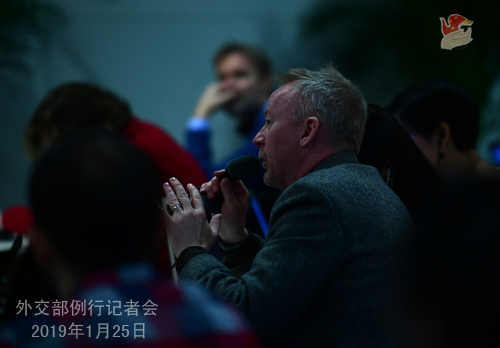 Q: There is a study published by Chinese and UK researchers, saying that China's Belt and Road Initiative could significantly increase the risk of invasive species. What is the Chinese government doing to prevent this? A: I have not seen the report you mentioned, so I am not aware of the specific details. With regard to the Belt and Road Initiative, yesterday I also said something about it, including the dialogue session on the Belt and Road during the World Economic Forum Annual Meeting. 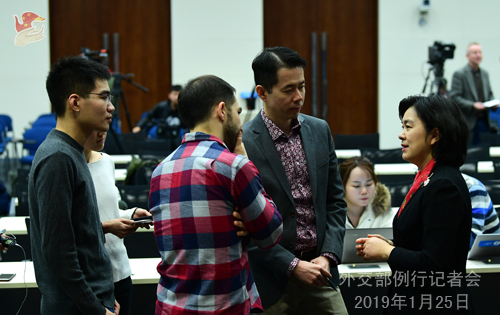 All the participants spoke highly of the benefits the Belt and Road Initiative delivered to countries along the route and pointed out that "mutual benefit" is one of the key words for this initiative. In the past few days, spokespersons for the Commerce Ministry and the National Development and Reform Commission have elaborated on the solid progress achieved by this initiative. I would refer you to that. Q: US Commerce Secretary Wilbur Ross said that China and the US are miles and miles from resolving the trade issue. What is your response to this in the context of the trade talks next week? A: I can understand that all parties are following closely the China-US trade talks. This also shows that the international community hopes that the trade negotiations can achieve positive outcomes because if China and the US can reach a mutually beneficial agreement, it is good for the two countries as well as the world economic growth. Now the working teams from the two sides are following the consensus reached by the two heads of state to maintain close communication. 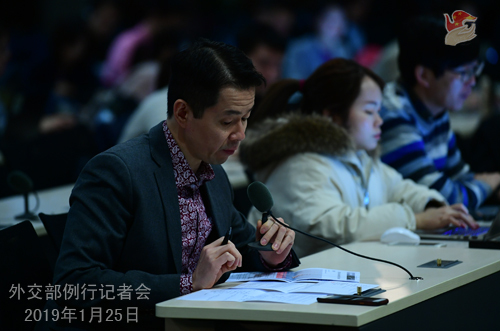 Q: Doctor He Jiankui has garnered a lot of attention for his work of gene editing with children. What is China's comment on the situation of this issue at the moment? A: As to the genetically edited babies, I believe you should ask the relevant department. I have noted that the relevant department has actually issued the information. I would refer you to that. Q: According to reports, the Secretary-General of Afghan High Peace Council is now on a visit in Beijing. What are the major topics for the two sides to discuss and what outcomes have been achieved? Does China have any new suggestions for the Afghan peace process? A: Mohammad Umer Daudzai, Afghan President's Special Envoy for Regional Consensus for Afghan Peace and the Secretary-General of Afghan High Peace Council is now on a visit in China that is scheduled from January 24 to 26. Assistant Foreign Minister Chen Xiaodong met with him. Special Envoy on the Afghan Affairs of the Foreign Ministry Deng Xijun held talks with Mr. Daudzai, during which they mainly exchanged views on issues like Afghan reconciliation. The two sides believe that dialogue serves as the fundamental way out for the Afghan issue and that the international community, especially the regional countries, should enhance cooperation to create a favorable external environment for Afghan reconciliation. China reaffirmed its support to the extensive and inclusive Afghan-led and Afghan-owned reconciliation process. We stand ready to play a positive and constructive role in achieving peace, reconciliation, stability and development in Afghanistan at an early date. Q: First, the Pakistani Finance Minister said yesterday that Pakistan is very close to sealing a finance deal with China. Can you confirm that? And will that deal include the IMF request for clarity and transparency about the conditions of lending? Second, there is report that the central bank governor Yi Gang will also be going to the US for the trade talks. Can you confirm that? A: Regarding your first question, you know that China and Pakistan are all-weather strategic cooperative partners. China has always been offering support and assistance to Pakistan's socioeconomic development as its capacity allows. We support Pakistan in taking measures to actively tackle and overcome the temporary difficulty facing it now. I am not aware of the specifics you mentioned. As to your second question, I am not aware of it.